Proclear Multifocal XR lenses correct high levels of presbyopia for sharp vision at all distances. 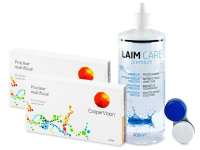 This economy package contains two boxes of three lenses each and a 400 ml bottle of Laim-Care solution. Proclear Multifocal are monthly contact lenses produced by CooperVision to correct higher levels of presbyopia. These contact lenses are designed for patients whose presbyopia reaches a high value addition (up to +4.00 ADD Power). Thanks to the brand's innovative Balanced Progressive ™ technology, Proclear Multifocal contact lenses ensure bright and sharp vision at all distances.